In the continuing sweepstake’s for the simplest bread recipe, Cook’s Illustrated weighed in this month with its own version. Sherry gave me a copy of the article last week. The testor’s goal was to improve on the NYT’s Slow-Rise Bread. As an indicator of just how easy the recipe is, I set up the dough yesterday, even though I am suffering from the worst cold I’ve ever had — and yesterday was the nadir. It’s an interesting recipe, whose variations I look forward to exploring. In fact, I liked it so much that I went on-line and started a subscription to Cook’s. 2. Lay 12- by 18-inch sheet of parchment paper inside 10-inch skillet and spray with nonstick cooking spray. Transfer dough to lightly floured work surface and knead 10 to 15 times. Shape dough into ball by pulling edge into middle. Transfer dough, seam-side down, to parchment-lined skillet and spray surface of dough with nonstick cooking spray. Cover loosely with plastic wrap and let rise at room temperature until dough has doubled in size and does not readily spring back when poked with finger about 2 hours. 3. About 30 minutes before baking, adjust oven rack to lowest position, place 6- to 8-quart heavy-bottomed Dutch oven (with lid) on rack, and heat oven to 500 degrees. Lightly flour top of dough and, using razor blade or sharp knife, make one 6-inch long, 1/2-inch deep slit along top of dough. Carefully remove pot from oven and remove lid. Pick up dough by lifting parchment overhang and lower into pot (let any excess parchment hang over pot edge). Cover pot and place in oven. Reduce oven temperature to 425 degrees and bake covered for 30 mins. Remove lid and continue to bake until loaf is deep brown and instant-read thermometer inserted into center registers 210 degrees, 20 to 30 minutes longer. Carefully remove bread from pot; transfer to wire rack and cool to room temperature, about 2 hours. I decided to use all-purpose bread flour — because I had it on hand, basically. Measuring 3 ounces of lager is a bit of a pain as you wait for the suds to subside. Might be a good idea to pour it ahead of time and let the bubbles deflate. The ingredients bound together nicely into a soft, shaggy, barely pliable ball. I let the dough rise for 18 hours. The idea of placing parchment in a skillet strikes me as a micro-management touch. Parchment is a good idea, but the Bittman recipe’s direction to place the formed ball on to a flour- or corn-meal dusted tea towel is just as if not more sensible. I poured the fermented dough on to the work surface and kneaded it a little before I formed it into a ball. I did as this recipe called for and slashed the top of the ball, lifted up the parchment and placed it in the Dutch oven to cook. I did NOT insert a thermometer to read the temperature — another instance of micro-management. Why would I want to break the surface of the bread and let air escape? After taking the lid off, I let it bake another 25 mins. I think the time will depend on individual ovens and how hot they run. The result was excellent. Lots of air holes in the crumb. The crust was not quite as hard as the other two recipes, but still very chewy and good. I’m not going to use a skillet. Just plain unnecessary and overly fussy. And I don’t see why I should cut a gash in the top when I can flip the ball over into the pot and still get the ragged top. The baking temperature and times worked perfectly. I wondered if the parchment has an added advantage of protecting the bread from burning on the bottom, which means that it can be baked in the pot for a long time than the other recipes call for. I like this recipe a lot. The article also contains variations for whole-wheat, rye, and a loaf with olives and rosemary. Update, 5/9/08: I haven’t made bread in a while, but before I took a break from it, I had made several loaves of one of the variations in the article. Now it’s the only way I make it. I adore the white version. But the whole wheat, lager and honey contribute to a fantastic loaf! I follow the recipe right through the 18 hours and then I revert to the NYT’s method of cooking (flipping the ball of dough that’s risen an additional 2 hours into a really hot Dutch oven and baking it as I described here. Follow recipe for Almost No-Knead Bread, replacing 1 cup (5 oz) all-purpose flour with 1 cup (5 oz) whole wheat flour. Stir 2 T honey into water before adding it to dry ingredients in step 1. And for good measure, I’ll add the rye version, but notice the different measurements, one of which is undoubtedly a typo. 7 ounces is 1 3/8 cups. Follow recipe for Almost No-Knead Bread, replacing 1 3/8 cups (7 oz) all-purpose flour with 1 1/8 (sic) cups (7 oz) rye flour. Add 2 T caraway seeds to flour mixture in step 1. I made the bread the same day Sally did. I was sure I was headed for disaster: my dough did not rise, there were no air bubbles covering the top like there are when I make the original Bittman recipe, and the two-hour rise produced nothing but a spreading mound of dough. Like Sally, I didn’t use a skillet, mainly because I didn’t have any parchment paper at hand. I let it rise on a kitchen towel, like I usually do, and then flopped it over into the heated dutch oven. 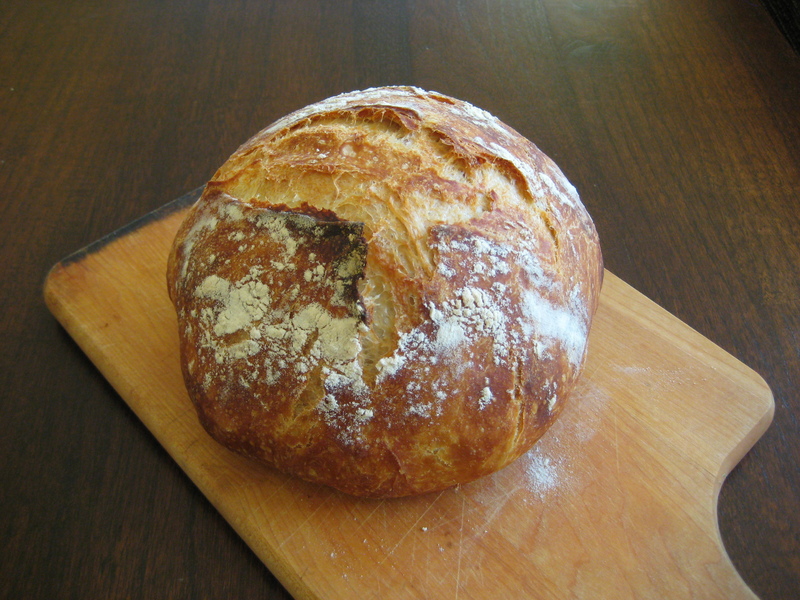 The result was a wonderful, crusty loaf with good texture. I just finished another loaf. Now that I’ve followed this recipe three times, I’ve decided the temperatures are too hot for my oven. Perhaps whole wheat loaves burn more easily. I’m not sure. Next time I make the whole wheat loaf, I’ll use the ones I adapted for the original Slow-Rise recipe: 475 to heat and then down to 425 when I put the loaf in the pot. I also halved the amount of honey. The first time I made the whole wheat, I thought it was rather too sweet. We’ll see in two hours how the new amount tastes. This loaf certainly got the jump that the best of the other versions did. And I love the color. Must be the lager and honey. So, all in all, I would use the amounts in this recipes but apply the Slow-Rise technique. Back in January when I first tried this recipe I was dismayed at the lifeless lump of dough after the first rise. I hadn’t read Sherry’s post yet, and I was less adventurous – I chucked it out, assuming I got it wrong. I tried again this weekend. This time it was the nadir of my cold, and through sheer neglect I let it rise for about 26 hours. Bubbles started to form on the top, and the texture of the dough was wonderfully soft. I let rise again for 2 hours, on a tea towel in the traditional method, and the resulting loaf was great, packed with air holes and a crunchy crust. It’s incredibly forgiving dough. thanks, Rosanne! I keep this blog mainly because it’s easier to point my friends to it than to make copies of all my recipes. But it’s also satisfying to make connections with other cooks. Let me know you have any suggestions to make on any of the recipes.